The former Gov has a new job -- as a columnist. Really. Alas, it's not a how-to column. Slate has hired Spitzer to write twice a month -- in a column called "The Best Policy" -- about government, regulation and finance. Said the online mag's editor-in-chief of Spitzer to NYT: "He's such a fluent talker, and intelligent and interesting on these issues. He also has a natural instinct to try to be provocative, whereas most former politicians have a tendency not to want to annoy anybody." It seems Slate didn't have try to very hard to convince Spitzer to do it. The first column was posted last night. It kind of reads like a wonkier version of Tom Friedman. And the tag at the end: "Eliot Spitzer is the former governor of the state of New York." 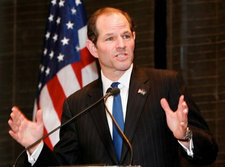 All joking about Spitzer aside, he was a talented politician with strong ideas who the electorate of New York validated. No amount of hanky-panky will ever take that away from him. Good for Slate for giving him a chance to write. I think Mr.Spitzer and Nancy P. should go sit down somewhere until other folks who know a whole lot more on how to run a private business make the decisions. Letting all the auto workers go unemployed is insane.